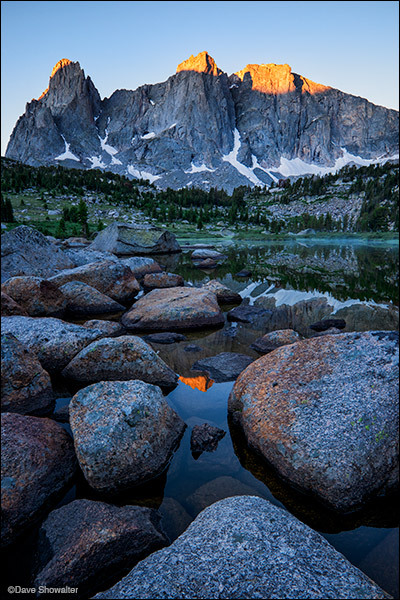 Sunrise grazes Warbonnet and Warrior Peaks reflected in Lonesome Lake. The Cirque Of The Towers is a world-renowned climbing area in the southern Wind River Range; the remarkable, vertical granite faces offer unlimited climbing options. Posted in Wyoming Mountains on August 5, 2014 August 5, 2014 by Dave Showalter. Merry Christmas and a Happy New Year from Dave and Marla in wintery Colorado, USA! 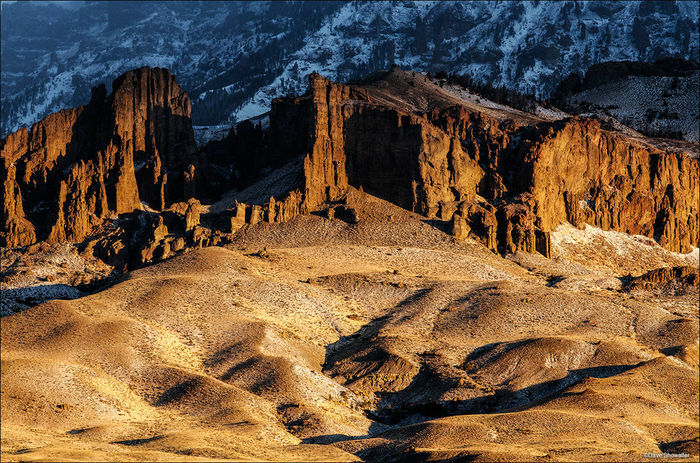 Posted in Photography, Wyoming Mountains on December 25, 2012 December 25, 2012 by Dave Showalter. Dave Willoughby of Daniel, Wyoming is shrounded in fog and mule’s ear sunflowers on the South Rim above the planned Noble Basin/Upper Hoback industrial gas field in Sublette County. Dave is a member of Citizens For The Wyoming Range and a stauch advocate for protection of this critical area. Good News! Yesterday, Jaqueline Buchanan, Forest Supervisor of the Bridger Teton National Forest announced that a new Supplemental Environmental Impact Statement (SEIS) will be required for Houston-based PXP Energy’s plan to drill in the Upper Hoback region of the Greater Yellowstone Ecosystem (GYE). That means that the process starts anew, with a full SEIS followed by a public comment period. The new SEIS wil account for all of the things we’ve learned over the last six years – road density and associated fragmentation, truck trips, threats to air and water with new monitoring techniques, threats to wildlife, like the largest population of moose in the GYE, threatened mule deer and pronghorn migrations, imperiled cutthroat trout, and endangered grizzly bears and lynx. The last go-round generated 60,000 comments, most overwhelmingly opposed to the plan that would also destroy some of the most important hunting and fishing lands anywhere. Thanks to Jacque for your courageous decision and congratulations to the good folks at Citizens For The Wyoming Range. I’m inspired by your united line in the sand and undaunting opposition while standing up for our natural and Western Heritage. Happy Thanksgiving! Posted in Politics, Wyoming Mountains on November 23, 2011 November 23, 2011 by Dave Showalter. My article, titled “Too Wild To Drill” is in the 2011/2012 Wilderness Magazine (page 44). The article details the contested plan to drill in the Wyoming Range; specifically Noble Basin of the Upper Hoback region in the Bridger-Teton National Forest. Many thanks to The Wilderness Society for your leadership in the community and efforts to preserve this critically imortant area! For all of those folks that say drill everywhere now, check out what Ted Williams wrote in his blog about the sustainable economic value that sportsmen bring to the table here. Posted in Energy, Wyoming, Wyoming Mountains on October 19, 2011 October 19, 2011 by Dave Showalter. 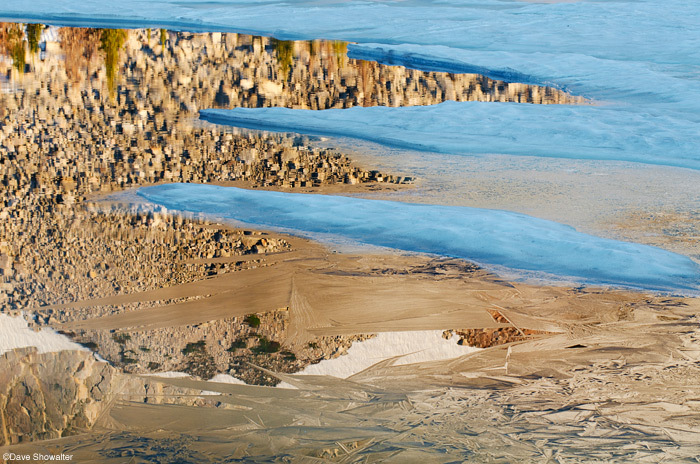 “This project is about more than just wildlife and stunning landscapes — it’s about the people that live, work and recreate along the Front,” said Barb Cozzens, the Northwest Wyoming director for GYC. Martin Kidston of the Billings Gazette wrote a nice article titled “Eye Of The Beholder” that appeared on the front page of the Wyoming section on 10/16/11. The interview took place at Copper Lakes in the North Absaroka Wilderness Area, part of the Tripods In The Mud Collaboration with Greater Yelowstone Coalition. Posted in Photography, Wyoming, Wyoming Mountains on October 18, 2011 by Dave Showalter. I just completed the second of three photo expeditions for the Tripods In The Mud Absaroka Front project, sponsored by Greater Yellowstone Coalition. I’m getting to know the area better, meeting wonderful people, and continue to focus on the remarkable diversity that makes the Absaroka-Beartooth Front one of the most important areas in the West. 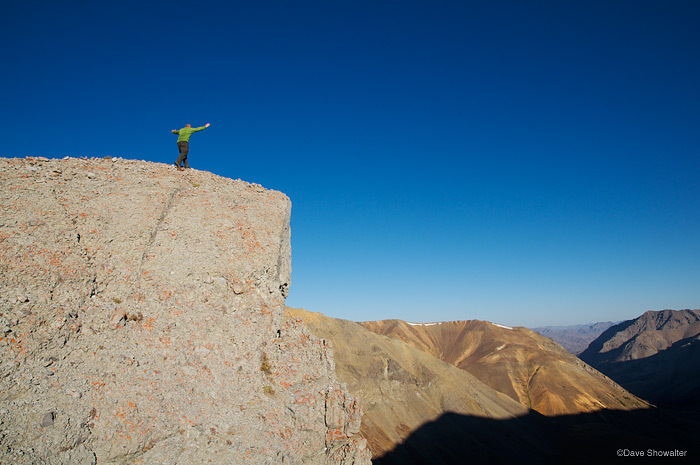 Self expression on Greybull Pass, high in the Absaroka Mountain Range. Posted in Energy, Wyoming, Wyoming Mountains on October 13, 2011 by Dave Showalter. Warm morning light brings out the brilliant colors in autumn tundra along the Greybull Pass Trail. Shoshone National Forest, Wyoming. I just returned from the second expedition of the Absaroka Tripods In The Mud Campaign on the east side of Yellowstone National Park (check out the blog on the ILCP site). The project is a collaboration with the Greater Yellowstone Coalition and the International League of Conservation Photographers aimed at keeping the Absaroka-Beartooth Front the way it is – free from industrialization where it’s wholly incompatible with wildlife, migrations, Western lifestyle, and recreation. The expedition was ten days with a trip to the Greater Yellowstone Coalition annual meeting in Jackson last weekend. It was great to meet the GYC staff and get to know members, to see so many passionate conservationists in one place here in the West. I got to know the landscape better on this expedition too – how things are connected, wildlife corridors, and the scale of the AB Front. I also saw first hand how devastating drilling contamination from bad fracking jobs is for people and watersheds. I’m completely convinced that the AB Front is the most important wild land remaining in the West and proud to be partnering with Greater Yellowstone Coalition to see that it stays that way. Please check back – I’ll be posting a photo essay here soon. Posted in Energy, Wyoming, Wyoming Mountains on October 5, 2011 October 5, 2011 by Dave Showalter. We just made a trip over the 4th to the Snowy Range in Wyoming’s Medicine Bow National Forest.The Snowies remain one of my favorite places from my early years in the West and my very first backpacking trip with Marla. This little range packs a lot of beauty and diversity into a small package. 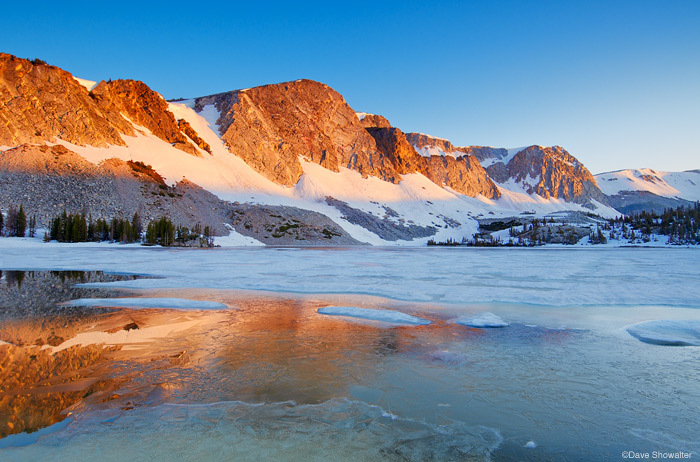 Old Main and the face of the Snowy range reflected in Lake Marie ice, early July. Snow fingers and ice carress a Snowy range reflection in a small patch of open water on Lake Marie. Posted in Wyoming Mountains on July 5, 2011 July 7, 2011 by Dave Showalter.